You’ve probably heard of “rat rods” or “rat rodding” or “rat rodders” before – but do you actually know what it means? To understand anything fully you’d have to go back to the beginning and for these unique vehicles, that means looking at their predecessors – the hot rods. “Hot rod” was a term used to describe a vehicle (usually a Ford Model T) that had been modified for racing on the street or drag strip. Classic rods were considered “hot” because of the after-sales augmentations that gave users more power and speed – rodders took a modest single carb engine with a top speed of 40-45 miles per hour (which was already nearly ten times the speed of the traditional horse and buggy) and replaced it with a dual carb single engine that let in more air and let more fuel circulate. Hot rods were the pride and joy of many young men returning from service during World War II and afforded them an escape from the daily grind of civilian jobs and other pursuits. These cars were usually flashy (for their time) and packed a lot of hidden extras under the hood. Rat rods on the other hand are the poor cousins of the early hot rods – and the owners actually liked and built them that way. They looked like hot rods that have been through a war of their own. 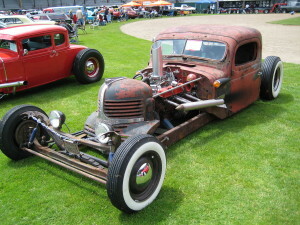 According to some definitions, a rat rod is basically an unfinished, junkyard hot rod. These ungainly clunkers were associated with the junkyard because most of the pieces for these hot rod wannabes were sourced from salvage yards and other found pieces. These ‘unfinished’ wannabes were usually put together in a way that screamed “not done” with the rat rod builder usually foregoing actual paint for a quick dash of primer with a liberal amount of rust showing through. Rat Rods – the vehicular equivalent of Frankenstein? These cars, for the most part, are all about “the look”. Builders and mechanics take pleasure in creating rat rods that looked like respectable vehicles but really weren’t. They have most of the requisite parts but with more than a few modifications – doorknobs that function as car handles, a large pair of pliers in lieu of an actual gear shift – if Frankenstein were a car, he’d be a rat rod. For the most part, they were originally built on the frames of Model A’s and other cars that could be bought for a song or salvaged from junk yards – the early creations were put together out of necessity during the Depression and owners scrambled to find parts that were cheap and in fairly good condition (rust optional), disregarding the need for it to look “good”. Most hot rod owners aren’t big fans of rats – however, they rank them far above those who have used billet rods on their American classic. Basically the biggest difference between a hot rod and a rat rod are that one was modified for speed, while the other for questionable “looks”. Ratters tend to stick together, forming clubs and putting on events just for their cars. Many members of these clubs choose to identify themselves from other folks in the car culture by wearing jackets and car club shirts with wild artwork and detailed designs. There is a whole style of cartoon artwork centered around rat rods as well. Artists like Ed “Big Daddy” Roth designed a his character “Rat Fink” to be the anti-Mickey Mouse. A green, scary mouse with bloodshot eyes and sharp teeth, Rat Fink epitomizes the “outsider” attitude of the scene. This style of artwork is still very popular and is seen on shirts at car conventions across the country.